Facebook's founder Mark Zuckerberg said the device would offer the types of VR experiences that previously required a device to be connected to a high-powered PC. It will be released in Spring 2019, priced at $399. At an event in San Jose, Mr Zuckerberg said he was well behind his target of getting "one billion people" using VR. He joked to attendees that he had achieved less than 1% of that goal, which he set at this event last year. Industry analysts have warned of declining sales of virtual reality devices. "Clearly the VR industry has struggled to get off the ground," said Bryan Ma, from IDC. "This year, we expect headset shipments to contract 23%." However, Mr Ma notes that much of that decline is thanks to some firms - such as Samsung - giving up on selling headsets that make use of smartphones to provide the visuals. He said newer standalone headsets - like the Oculus Quest - had a more promising outlook. "The pricing is impressively aggressive," Mr Ma told the BBC. "But if price were the only barrier, then Go would've done a lot more units too." Facebook released Oculus Go last year as a budget standalone headset, costing $199. It sold an estimated 289,000 units between April and June of 2018, according to SuperData. "The bigger issue is the content," Mr Ma said. "Hopefully Oculus Quest helps to address half of the chicken and egg issue, especially with the benefit of Rift-like performance." Facebook announced several content deals with the NBA, YouTube and an exclusive VR series based on the Star Wars franchise, produced by British special effects studio, ILMxLab. The Oculus Quest works with two hand controllers, and in-built sensors mean the wearer has six degrees of freedom. That's a term given to how much a person is able to physically move within the virtual reality world. As well as moving your head to look up and down, and turn left and right, having six degrees means its possible to move back and and forward, as well as higher or lower. In gaming, six degrees of freedom gives the ability to, for example, lean over ledges or crouch behind objects. 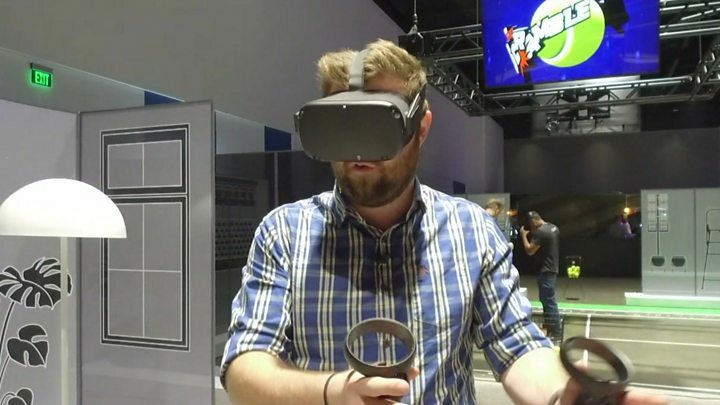 Facebook said the Oculus Quest can also track the room around you, allowing you to walk around as much as 400 square feet of space - as long as there are no objects in your way. The firm will continue to sell its PC-connected Oculus Rift, saying that device will further "push the limits of what's possible".